Pinch Front Diamond Back Tank Leotard will bring a touch of sophisticated glamour to any ballet class. Featuring an open back with thin crisscrossing straps, this tank leotard is designed with Motionwear’s signature Silkskyn Luxe (91% Nylon, 9% Spandex) for ultimate comfort and flexibility. Featuring luxurious diamond lace on upper back, and a full front liner, this sleek modern leotard features the Boston Ballet School logo on the back waistline. Available in Sea Stone and Black. 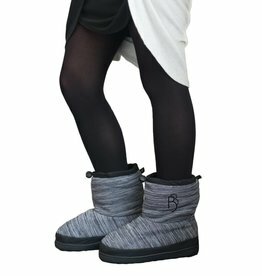 Heather grey booties have the Boston Ballet logo embroidered in black on the left shoe. 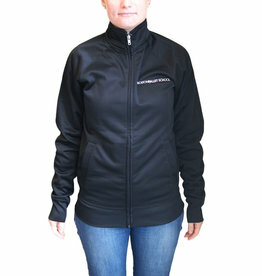 This lightweight, black jacket with pink embroidery is water-resistant and moisture wicking.